The big news, of course, is that Marty Balin is back. Balin never seemed to be able to get it together outside the Airplane/Starship, although he certainly did try. But nearly everything he started crumbled before it was finished. Bodacious D.F., his last band, showcased his vocals nicely, but somewhere between the decision to record a second album before going on tour and actually doing so, the band vanished. 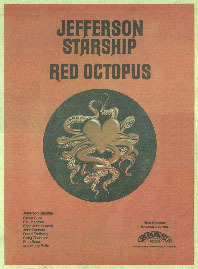 He joined the Starship for one song, "Caroline," on their last album, and from all the press and radio play it got, you'd have thought it was the only song on the album. Clearly, they needed him. And good thing they got him, too. 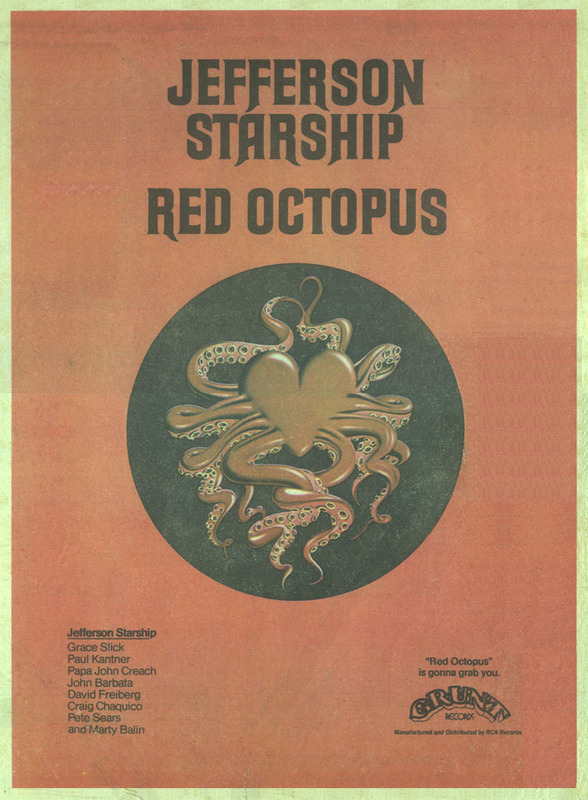 If it weren't for Balin, Red Octopus would be completely unlistenable. As it is, it sounds like a revue instead of a band, with Grace Slick getting her couple of songs, Papa John Creach getting his instrumental, Pete Sears getting his and so on. And with Grace's vocals now devoid of whatever subtlety they might have had, Marty's the only vocalist in the band. In fact, two of his songs, "Miracles" and "There Will Be Love," are not only good "for them," but downright good. "Miracles," already an FM hit, is the choice for a single and, with its lush string backing, the ideal "comeback" vehicle for Marty. But the rest of the album is sadly undistinguished at best and embarrassing at worst (Kantner plumbs new lows with lyrics like "I want to see another world/ For me and my child/ My old lady too." Nice of you to remember the lady, Paul). Papa John is all but inaudible throughout (I never did figure out what he was doing in the Starship, but maybe that's my hangup), and Pete Sears's instrumental, "Sandalphon," is quintessential filler. If only because it gives Marty Balin a place to write and sing, I wish the Starship well. Maybe in a couple of years there will be a Starship's Greatest Hits album, and I'll undoubtedly want that one -- it'll be Marty Balin's greatest hits, too. - Ed Ward, Rolling Stone, 9/11/75. The recharged Starship duplicates the power and energy of the early Airplane here while still bringing fresh elements to the music. Marty Balin returns as a full time member with this set, Grace Slick's vocals are stronger and she sounds more interested than she has in several years, and the harmonies worked through by Balin, Slick and Paul Kantner sound uncannily like the Airplane at times. The rest of the band (bassist/keyboardist David Freiberg, keyboardist Pete Sears, violinist Papa John Creach, drummer John Barbata, lead guitarist Craig Chaquico) sounds as if they have been together for years, with guitar and keyboard work particularly outstanding. Good balance between rockers and ballads, but up-tempo instrumentals with some excellent lyrics and vocal interchanges between Balin and Slick are high points. LP is a fine example of the ability to recapture some of the good music and feelings of the past without looking backwards. Best cuts: "Miracles," "Sweeter Than Honey," "Al Garimasu (There Is Love)," "Play On Love," "I Want To See The World," "There Will Be Love."